The launch of the Nokia Lumia Icon on Verizon might be seen as a bridge: from Nokia to Microsoft, and to extend a flagship Windows Phone from AT&T and T-Mobile onto the nation's largest wireless carrier. Ifi Majid, head of marketing for Nokia's Smart Devices business in North America, knows the obstacles Nokia faces. He showed off a video, aimed at developers, that downplays the number of Windows Phone apps the platform has, compared to Android and iOS. "Do I need over 100 apps to turn on my [phone]s] flashlight?" it asks. Of the top ten apps of all time, four of them run on Nokia Windows Phones. Majid then points out how well Windows Phone has done in other regions of the world, such as the oft-cited statistic where it has outsold Apple in Italy. What the Icon is a flagship phone, Majid said, optimized for a carrier which sells two Nokia phones: the Lumia 928, and a pre-owned Lumia 822 for pennies. HTC's 8X and the Samsung ATUV Odyssey make up the other two Verizon Windows Phones. "How do we bring some of the flagship technologies into Verizon... how do we bring some of the Windows Phone growth into Verizon, that we've seen with AT&T," Majid said of the design. The Icon measures 5.39 x 2.79 x 0.39 inches, and weighs 166 grams--all significantly smaller than the 1520. Inside the phone is a 2.2-GHz quad-core Snapdragon 800, plus 2 gigabytes of RAM. As with other Lumia phones, the case isn't removable, and hides 32 GB of storage, a 2,420 mAh battery (good for 16 hours of talk time, Majid said, and one that can be wirelessly charged)--and no expandable storage. That's left to the cloud, and the 7 Gbytes of OneDrive (nee SkyDrive) storage that ships free with the phone. As our hands-on with the Icon notes, the phone is inky black, with metal replacing the traditional plastic, giving it a solid feel. Th 5-inch OLED screen provides 441 of pixel density, and up to 500 nits when exposed to bright sunlight. It's protected by Corning's Gorilla Glass 3, as well as technology from Synaptics that will let it be used with gloves. But it's the camera where Nokia has traditionally shone, and the Icon is no exception. The only concession that Nokia made was to eliminate the highest-end cameras (and the resulting bump) of phones like the Lumia 1020. Otherwise, the camera is the same 20-megapixel camera--with optical stabilization, an f/2.4 lens, dual LEDs, a front-facing 2-megapixel sensor that shoots 1.2-megapixel images, and 1080p video recording at 30 frames per second. Since the Lumia Icon includes the Nokia Lumia "Black" software revision, it's eligible to upgrade to the Nokia Camera app that adds greater manual controls and a "smart sequence" technology that shoots a series of photos in succession. 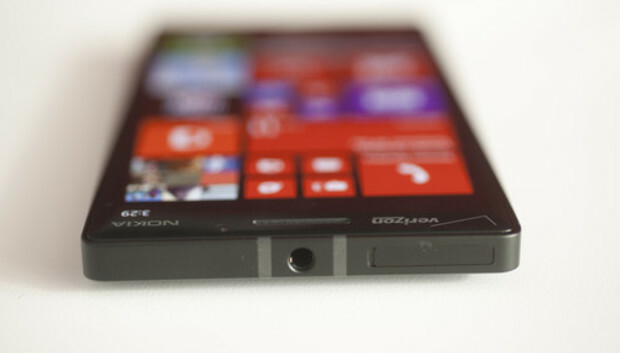 The phone uses the 700-MHz LTE band, plus 850/1900 Rev A CDMA. It can roam on the 850 MHz, 900 MHz, 1800 MHz, and 1900 MHz GMS band, as well as UMTS 850 MHz, 900 MHz, 1900 MHz and 2100 MHz. Additional connectivity is provided by WiFi 802.11 a/b/g/n/ac, as well as Bluetooth 4.0 LE. What does this mean for Microsoft? Nokia obviously chose an iconic name for its flagship phone, rather than perpetuating its series of numbers. Iterations like Surface 2 and Windows 8 aside, that's the same approach Microsoft has chosen. "We thought about differentiating the Verizon name, and we agreed with Verizon to promote the name, and to differentiate the phone from other Windows devices," Majid said. Eventually, when the Microsoft-Nokia merger is completed, Microsoft will have to decide on the future direction of the Lumia line. Majid noted that since Nokia is driving the majority of sales for Windows Phone, the company has a "good relationship with Microsoft from an engineering and marketing perspective". Code, perhaps, for "Back off--we know what we're doing." Updated at 11:34 AM with additional details from Nokia.